TravelTuesday Picture of the Week: New Year’s Wish Balls at Marina Bay (Singapore) | So Not Lost! I’m not quite sure if it’s something rooted in tradition, or simply a gimmick created by the Singapore tourism board, but for the past three New Years that I’ve been here, wish balls have been floating in the Marina Bay area. These large, white, buoyant balls can be seen around Singapore, and people can write their New Year’s wishes on them before they are sent floating into the sea. As I have not been to a New Year’s Eve celebration at Marina Bay, I’m not quite sure what happens to them when the clock strikes midnight. 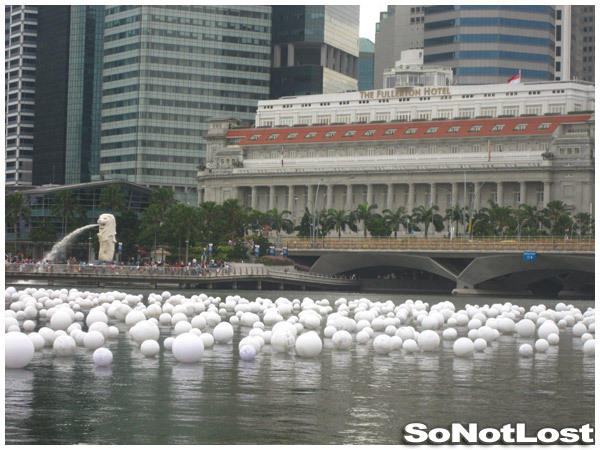 Here’s a photo of these balls floating right in front of the Merlion and the Fullerton Hotel.